A God-sized dream is simply a desire in your heart for more of whatever it is He has for you. So in many ways, God-sized dreams aren’t about size at all. They can be big or small in the world’s eyes. But they all matter equally. And we all have them–yep, even you. Over the last few years, I’ve connected with thousands of women about God-sized dreams. That journey began as a series on my blog, turned into a book, influenced my work as a life coach, and led me to start a God-sized dream team last year. The women on that team and I had a deal: they’d help me spread the word about my book and I’d coach them in their dreams for the next six months. But God had a lot more in mind. A whole lot more. Out of that group came the women here who have founded this site. Women I’ve watched take brave steps, push past fear, make it through discouragement and celebrate victories. They’re a wonder to me. And being here on these pages with them is an honor. That’s the thing about God-sized dreams: they start with you and then God takes them in all kinds of directions you never saw coming. I’m wildly cheering these women on in this new adventure and look forward to having my words here from time-to-time too. There’s never a perfect time to begin a God-sized dream. You don’t need to have it all together. You just need to do life together. The greatest joys of the journey are the people you connect with along the way. as she launches Coffee for Your Heart: 2014 Encouragement Challenge! Every day this week, we’ll be featuring a special giveaway. 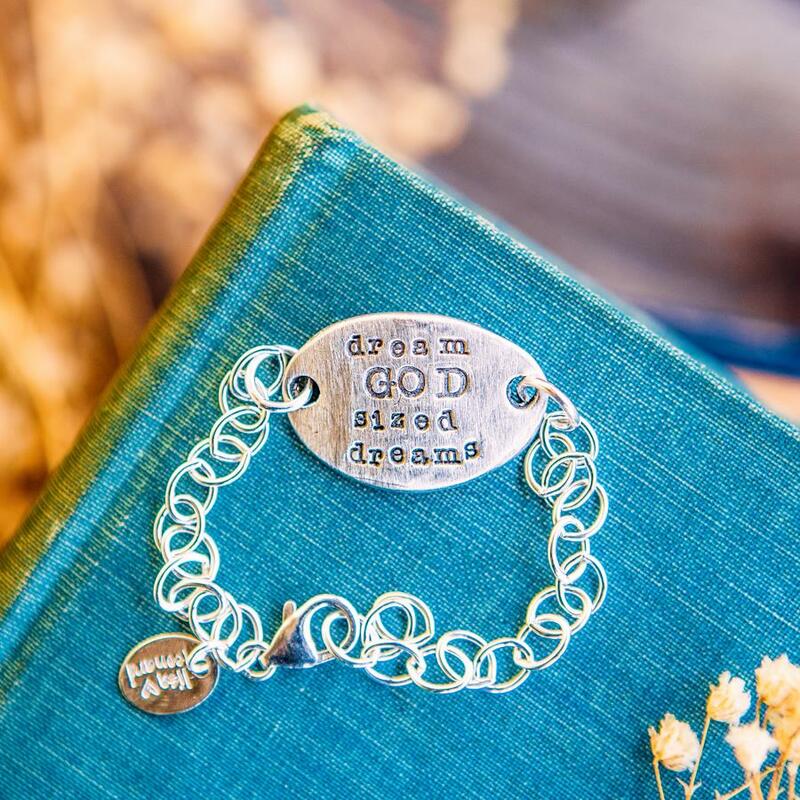 Today it’s a Lisa Leonard God-sized dreams bracelet from DaySpring! It was inspired by Holley’s book, You’re Made for a God-Sized Dream! Enter via the PunchTab link below. We’ll keep all giveaways open until Friday, 1/03/2014 at 11pm, to give everyone lots of time to enter! We’ll email the winner and you’ll have 48 hours to respond, or a new winner will be drawn. I have had a God-sized dream. By taking me on a most amazing journey, God has given me the opportunity to lead an outreach ministry through my church. ..something I would never have dreamed of or even chosen for myself 4 years ago. I blog about it, but I really feel led to write a step by step how-to so others can duplicate the ideas and reach their communities for Christ. I have a burning desire to speak to churches on this subject and ignite an ‘external focus’ fire in their hearts! Cheering you on, Toni! Your generous spirit is evident, and evidence of your love for Christ. My God-sized dream is to write a book. Oh Michelle – that’s an exciting dream! Go for it. I just wrote my first book and there were days I never thought I’d get it done. Just wake up every morning and churn out a page, we’re cheering for you. My God-sized dream has many layers, but the foundation is to let God have his way in me, which many times means letting go of my ways. Isn’t that the truth Kristin? Mine too, walking right alongside you friend. My God sized dream is to teach sign language to the people in 3rd world countries. I love to quilt and think that would be a fabulous way to teach them. As a person with a disability this would truly have to be God’s doing as most of these places, I assume, might not be accessible. Cathleen – I LOVE this! You know one of the most beautiful forms of worship is when I have seen people do sign language with a worship song and their whole soul is involved…cheering you on! God ABSOLUTELY knows and He will reveal it…He will lead the way and many people will grow and heal with God’s tender help and yours! Happy New Year Leslie! Thanks for sharing these kind words, Holley! Happy New Year to you too, Alexis! This year my dream is to be profitable enough to afford a local homeschool co-op for my girls, a mom’s morning out for my boy, and sponsor another Compassion child. It feels kind of impossible today…. trying to be patient/wait is hard work. I agree…waiting is often the hardest part. Cheering you on in the in-between, Melissa! Grateful for you, girl! I’m still searching for my God-sized dream. This year would be to self-publish my second book! Barbie – I think we are all seeking in different ways aren’t we?! My prayers are with you as you work on your second book!! My God-sized dream is to …. be a Mama. 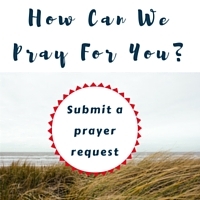 Praying for God to grant the desires of your heart, Lydia! Thank you for being here today! My God-sized dream is to clearly see the best way to guide others to the resources they need for making a difference in the world through their everyday life. Still working on the how and what of that. Amy I think God is already using you in that way through (in)courage and the community groups…you are such a blessing and I know that God will continue to do great things with you!! Blessed by your service and calling to seek Him!! My God-sized dream is to share with women of all ages, both through the written and spoken, that because of God working through them they are enough. They don’t have to meet any requirement or finish and works for Him to accept them, love them or use them. Amy I love this! This is a message that we need to keep shouting on the rooftops!! As women I think we believe that we aren’t enough and it is so nice to see that there are beautiful women like yourself being an encouragement! Thank you! “A God-sized dream is simply a desire in your heart for more of whatever it is He has for you.” I love this!! My God-sized dream is to minister to and love on the women who work in the legal brothels in Nevada. Particularly to reach out to the women at the world famous Mustang Ranch…I want to raise an awareness in the general public that these women are not there, doing what they do, to fulfill their own dreams. They are not there by choice. God is continuing to create connections for me to reach this goal and I pray that this is the year that I begin to go into the brothels to meet, get to know and love these women. Between that burden that God has placed on my heart, my family, church, and writing dreams, I know that I will need more and more of Him in my heart, and every moment of my day in order to accomplish these dreams that He has placed on my heart. That is a beautiful God-sized dream, Gay! … get an inspirational, faith-based essay about hope and joy published in a major woman’s magazine, now that I’m a published author and my book received 2 gold MarCom Awards in 2013! God is so awesome. Congratulations, Lee, and cheering you and your words on in 2014! My God-sized dream is to reach more women with inspiration of Christ and the impact He will have in their lives if they open their hearts to Him. I want my blog to reflect Him. That is a beautiful dream, Mary. And I know God will honor your desire to help people draw near to him through your words. Right now my God-sized dream is to launch my own home-based business, wherein I would offer my services as a proofreader and copy-editor. There are so many wonderful writers out there with some very important messages that need to be heard, and I’d like to help them polish their manuscripts to create the most clear and impactful works possible. I’ve almost got my website ready and the idea of actually putting it out there scares me to death! Kim, Editors are essential to every writer! I’m so glad that you’re going in this much-needed direction. Blessings to you and your business! There are many, many dreams in my heart! But it feels like there is one dream God is asking me to focus on this year (and last year), and that is to continue to walk down the road toward publication for the book I’m co-authoring. We’ve met with publishers, and a couple have it in their possession, so it’s just a waiting game at this point. But I feel Him nudging me to continue writing on it as I wait. So that’s what I’m going to do. Hi Holley- Happy New Year! 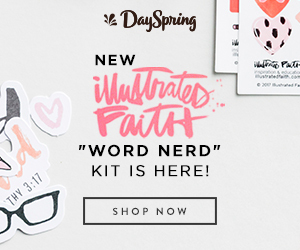 So great to see this new blog! 🙂 I love it! Our God sized dream was to launch this website: http://www.bravegirlcommunity.com we did it yesterday! So, thankful for the promises in God’s word and for the encouragement that community provides! Thanks for your encouragement last summer at She Speaks Holley! Love that, Tina. It makes me think of how we’re called to go into “Jerusalem and Judea and the ends of the earth.” Your Jerusalem is your hometown–what’s close to you. So I think it’s wonderful that you’re starting there! My God Sized Dream? Not sure yet. I’ve got the book but am terrified to crack it open and get started. That probably means I REALLY need to do it, but for some reason the idea of living a God Sized dream is beyond terrifying to me. Counterintuitive, I suppose. Girl, that fear is a chihuahua that sounds like a doberman. All bark and no bite. You go get that puppy and show it who’s boss. We’ve got your back and we’re cheering for you! My God-sized dream is to publish “Not Afraid To Say I Love You” in 2014! Thanks for all your encouragement! That’s a great title, Mary!! My God Sized Dream is to publish children’s books and tell my story through blogging. Well on the way in both areas, but I long for children to KNOW HIM and praying my books bring them closer to Him. Yes! I’m so proud of you Deb! It’s no wonder God gave you this dream–your love and tender heart make you the exact person to do this. Praying for you and cheering you on! Influence and encourage women for Christ. Whether it is through blogging, speaking, teaching, inRL…..I’m open! Love your God-sized dream, Amy! Keep going, girl! serve with a loving non judgemental heart. My God Sized Dream Is to…. be a missionary to my family. To stop looking at what I haven’t done and start living the grace and mercy of Jesus to those around me. Everyone Else Has A Dream, What About Me?